I don't believe in settling. People often confuse these two statements. I hear people using them interchangeably, but they're not the same. Compromise is about ideas in conflict coming together to create a workable and beneficial amalgamation, hopefully one that increases harmony, reaches a balance and combines efforts. Wikipedia says, "In arguments, compromise is a concept of finding agreement through communication, through a mutual acceptance of terms—often involving variations from an original goal or desire." 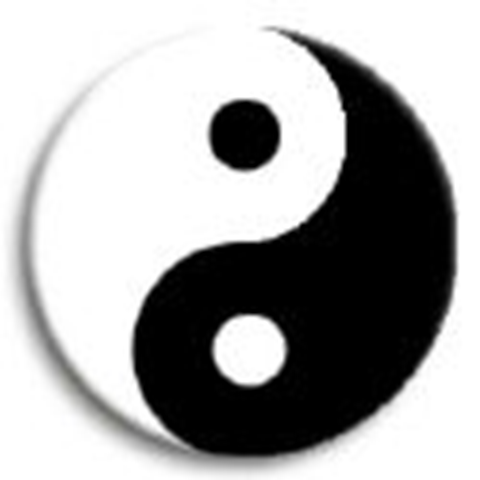 As with the concept of Yin-Yang, opposing forces can also be complementary and achieve a balance. A balance that is in movement, keeping one another in check. Compromise is healthy, sustainable and central to the process of growth and development. Settling is about stopping. Settling is the process of coming to a stop. Bodies in motion coming to rest. When people misuse settling as a term that is interchangeable with compromise, what they're really saying is that it's time to give up. Time to come to a rest and stop debating, stop working towards a better solution, stop improving what exists today. Whether you're settling for a relationship partner, or settling for a job or settling for who you are, don't kid yourself: you're not compromising. Rather than giving some of your ideas to a shared conception of the way forward, you're pulling back from the conversation and refusing to struggle to be part of the better future that can exist. There is no way forward when you settle. There is only here. Here is not good enough. Are you settling or compromising? I think a potential additional benifit of "compromises" is that they are not necessarily zero sum games, but you can also grow the pie in a mutually benificial way to the respective stakeholders. compromise happens between two people with a common goal. settling happens with one person. Hmm, Sylvia, interesting perspective. Feels a bit too simple for me, but I see where you're going with it and I like the "external vs. internal" implication. Thanks for the comment!